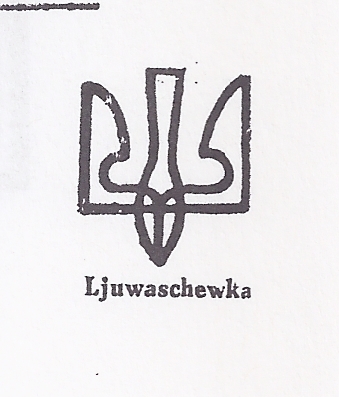 You know there are going to be problems about Lubashivka when you try to spell it. Dr Seichter tries both LUBASCHEWKA and LJUBASCHEWKA. Dr Ceresa sticks with LIUBASHIVKA and John Bulat with LUBASHIVKA. 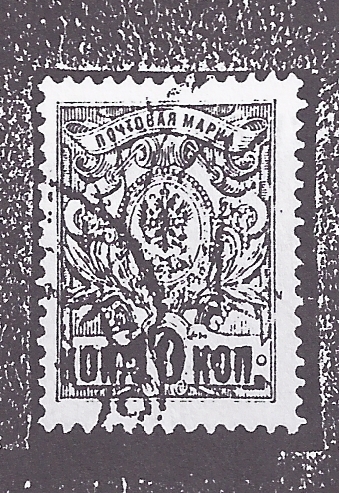 I follow Bulat here but reckon that the Imperial postmark would have read LIUBASHEVKA (this is what I transliterate from the late Gary Combs' Imperial postal place names list - I can't reproduce the original Cyrillic here). At the top Dr Seichter shows us a stamp, or rather a photograph of a stamp, which is reproduced in Dr Ceresa's publication on the Special Trident Issues (Plate CDXCIX). 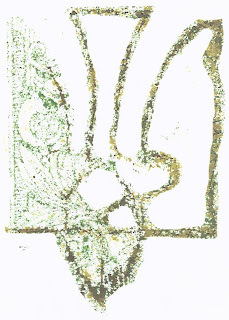 Underneath is Dr Ceresa's enhanced copy of this photograph - he has drawn in the lines of the trident so we can see them. Next comes John Bulat's design (page 128 of his Handbook) followed by Svenson's 1932/5 catalogue illustration. Then there is a random illustration which Dr Seichter has on his album page. Then comes a Seichter drawing based on another stamp. Finally, there is John Bulat's illustration for an "Unknown" type at page 137 of his book. Well, even a casual glance should indicate that our authors are not in agreement. 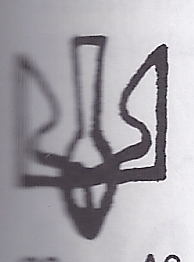 Does the central spike balance on the top of the base cap with a horizontal line (Bulat's first illustration) or is it pinched in (Svenson's illustration) or is the space between base cap and spike open? These are major differences! What - if anything - is the truth? Well, the 10/7 kopeck used stamp of which Dr Seichter has a photograph turned up in the Schmidt collection, signed by Dr Seichter. 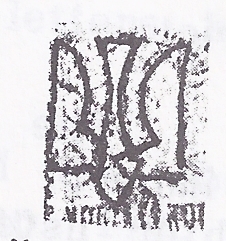 In addition a 15 kopeck imperforate used stamp was linked to it with a note from Seichter and his signature. When Dr Seichter writes "so eingepäckt nicht möglich zu signieren" - so packed up like this not possible to sign - he means it literally: some of Schmidt's rare stamps were enclosed in tiny cellophane packets which were used before the days of Hawid mounts. They are very difficult to open - I use a scalpel to slit them and take out the stamps and I did this going through Schmidt's collection, keeping the little pieces of paper for future study. But of course Dr Seichter could not sign a stamp packed up in a cellophane bag! So he signed these little slips of paper instead with his official handstamp. 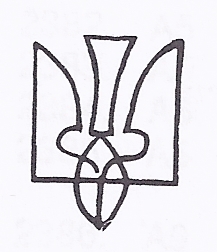 The Trident on the 15 kopeck is unclear. 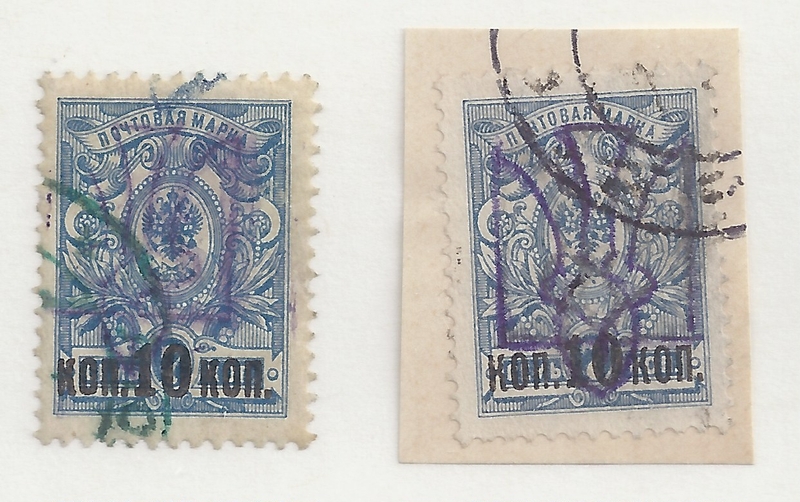 But there is something important that these two stamps have in common and which would lead anyone to group them togethere: the cancellation is the same and it is in the same (and unusual) blue-green ink. 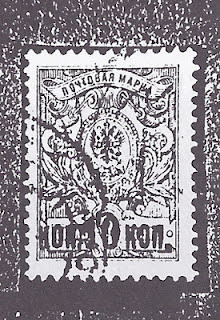 And in the case of the 15 kopeck two letters are very clear and they read "...ASH..." just as we should expect if these stamps have anything to do with LubASHivka. 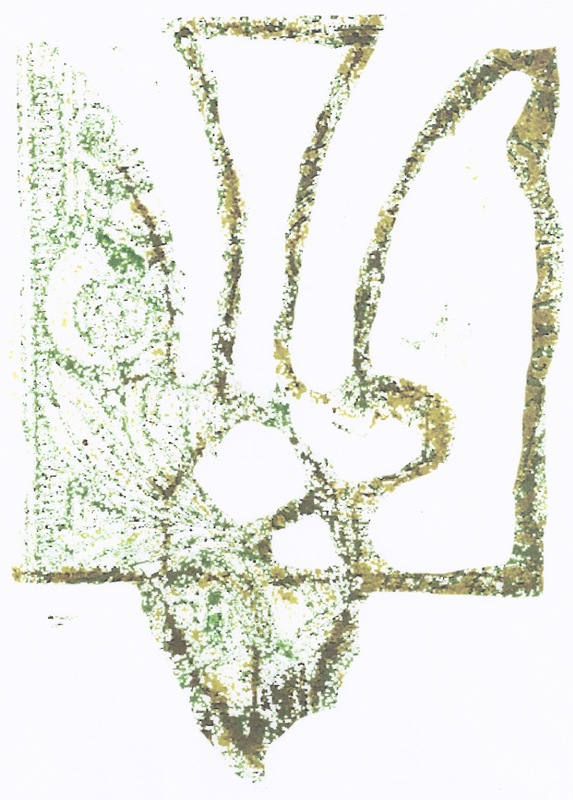 In addition, both the trident overprints appear to be in the same ink and they both appear to be of the same dimensions (they are large tridents as Tridents go). 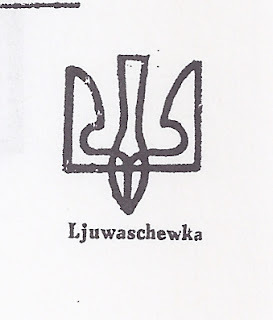 Seichter does not list the Lubashivka Trident on a 15 kopeck imperforate. Neither does Bulat. They both list it on the 15 kopeck perforate. But Svenson lists it on the 15 kopeck imperforate and not on the 15 kopeck perforate.This is relevant to what follows. 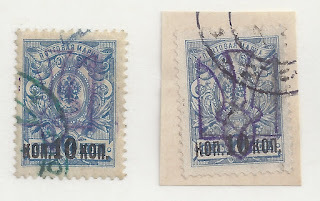 Go to Bulat page 137 where he has the "Unknown" Trident illustrated last in the display above - and there he lists a 15 kopeck imperforate with violet overprint (Bulat Q4) and comments "The 15 kop has been found with a partial cancellation in green ink which has the same characteristic as the ink used in Lubashivka". Bulat probably got this information from Seichter or Schmidt and it may be that all that has happened over the years is that imperforate got switched to perforate at some point. But there remains a genuine question: Are these two stamps with characteristic Lubashivka cancellations overprinted with the same Trident or not and, if so, which Trident among the ones I have illustrated? This time YOU have to do the work. Just click on my image to enlarge it. Comments welcome. 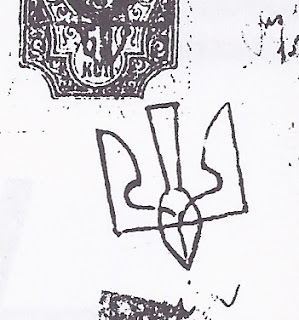 Tobias Huylmans using more advanced methods than I have available gets the Trident image below from the 10/7 kopeck Seichter signed stamp (the stamp on the left just above). It confirms the fan-like top to the spike but leaves some doubt about how the spike joins the base though it rules out the idea of the spike sides smoothly joining the base cap and leaving the middle space open. I'm well out of my area of expertise here but I'd say the two tridents are different. 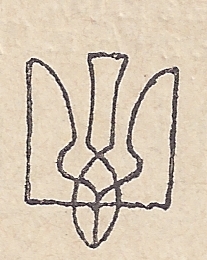 The flat top to the central spike seems to be wider on one than on the other stamps, and the base cap looks different too. Incidentally, why does someone (clearly NOT Dr.Seichter, as he signed the stamp) write "packed up like that, not possible to sign"?